We will soon be adding a new piece of functionality into the apprenticeship service. This will enable levy-paying employers to add apprentices and set up payments to training providers. We've recorded this video to take you through how the process will work. As lead user researcher, I’ve been asking employers how they feel about using this bit of the service. These are the most common questions. 1. How much administration will I have to do when setting up payments? You can choose to do as much or as little as you like. To set up a payment, you’ll need to add apprentices to the account. You can choose whether you do this, or whether you would prefer to ask your training provider to do it for you. If you choose to hand it over to your training provider, all you’ll need to do is set up the request, and then approve the data when your training provider sends it back you. You can do this as infrequently as once a month or more frequently if you want to. 2. Should I give my training provider access to my account? 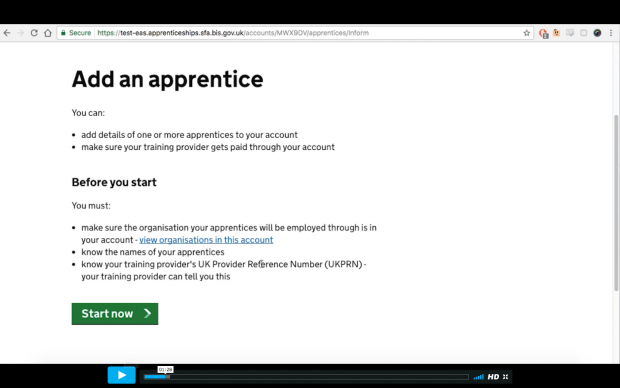 No, training providers will have their own access to the apprenticeship service and they'll be able to add apprentice data for you from there. The apprentice data will then be sent back to you for approval. 3. What’s the deadline each month for adding apprentices to the service? Your training provider will need to submit data about your apprentices to the Skills Funding Agency by the 4th working day of each month, and that data needs to match the data that you have approved on the apprenticeship service. You should talk to your training provider about a reasonable deadline to allow them to make sure the data is in order before the end of the month. 4. Which of my connected companies should I register my apprentices against on the service? If you have more than one connected company registered to your account, you’ll be asked to select one of them as part of the process of adding the apprentice details to the account. The connected company you select should be the same as the company named on the contract with your training provider. The training provider will have to verify that the organisation on the contract is the same as the one approving the apprentice details on the service, so it’s important to make sure that this is done correctly. 5. Do I have to upload the contract between my organisation and my training provider? No - whilst the agreement with the Skills Funding agency states that you must have a contract in place between your organisation and the training provider, this does not need to be uploaded on to the system. This is the latest post in our series on the apprenticeship service. If you'd like to read more, you can sign up for email updates or subscribe to our RSS feed. You can also follow @SFADigital on Twitter.